Unique Monterey attractions are to be found everywhere you turn in this central Pacific Ocean environment. You've been on a beach walk, and maybe had a really good coastal mediterranean dining experience but now what? The Monterey Peninsula is the travel destination for thousands of visitors each season. If your new to this wonderful part of the California coast you might be surprised by the scope of activities that are available both nearby and within several hours drive of Monterey. Some of the day trip destinations on this page of the website are local, but despite their close proximity to Monterey and Carmel are worthy of a half or full day outing. Other Monterey attractions and day trips are as far as two or three hours away. If you travel to some of these places, and I think you should, Monterey and Carmel would be your home base. There is so much to experience here. If you one of the many who have traveled here from Europe or from Seattle or any distant location, and you have a few days, one or two day trips would be well worth your consideration. If you are wanting Monterey Attractions and experiences that will be etched in the memory books for a long time and one your grandchildren will hear about, rent a Dukati mortorcycle (or a convertible) for a day or two and head down the coast to the magical and serene village at Big Sur and then on to Hearst Castle. Hearst Castle sits at the top of a hill that was once the place where the Randolf family "got away" from the struggles of city life, and enjoyed picnics here before the mansion was built. The views down the coast are healing and the ambrosia burger and chilled wine will probaly help, but spend an hour here to rest a bit before you journey farther down the coast. If you want a more sophisticated menu choice, drive up the hill at the red barn off of Highway 1and try lunch at the Ventana Inn. This place is less crowded and still has the sweeping views down the southern coast of the Pacific Ocean. If you want to stay here for the night and are still feeling adventurous, go glamping at the Treebones Resort and sleep in a yurt with full ocean view. For dinner stop by to their 30 foot sushi bar and view the ocean in a way never imagined before. This is a place that you really need to experience and what better way to enjoy it then after a long ride. 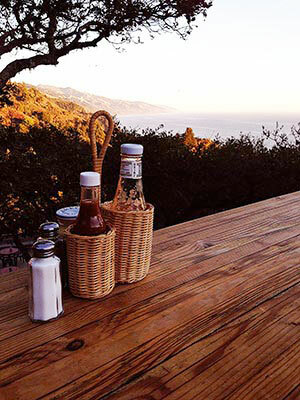 On the way, stop at the famous Nepenthe cliffside restaurant where 1940's actors Orson Wells and Rita Hayworth camped where this restaurant now sits and loved it so much that they bought the land for a mere one hundred dollars. Imagine...A few burgers, some fries and a bottle of wine today might come pretty close to what these legendary actors paid for this stunning acre of land eighty years ago. 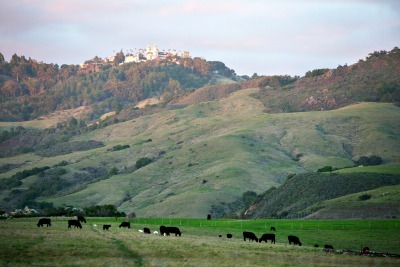 If you plan your Monterey attractions well ahead, you can take an evening tour of Hearst Castle the next day after the sun sets and step back in time to the 1920's and tour an estate that covers 270 thousand acres of spectacular hillside property that looks directly down on the ocean below. Be sure to see the free movie "Hearst Castle Building The Dream" while you wait for your tour. It is the perfect introduction to the era in which this mansion was built, and really sets the mood for your tour. If you want to stay near your home base, try the Monterey attractions just a few miles from your front door. A full or half day at the Refuge Spa tucked against the green hills in Carmel Valley will only set you back about $35 and allows you all the time you need to experience what some say is the perfect spa experience. Following the Scandavian concept of total relaxation, you will find sauna rooms, cool and cold (actually it's called the Artic plunge) water immersion followed by a warming room or outdoor fireplace. Top that off with a ocean view sunset dinner at the Pacific Edge restaurant in Carmel Highlands and then a live theater production at the Sunset Center in Carmel and your day trip is complete. 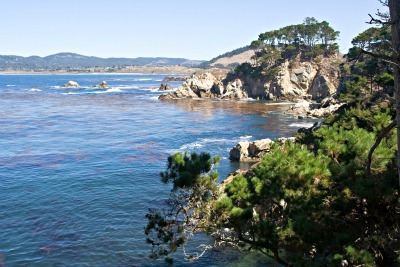 You could also spend a half day at Point Lobos State Park just a mile south of Carmel where docents and sea lions will guide you to see some of the most scenic coastline anywhere in California or visit historic Moss Landing. Whales come here very close in the winter months...sometimes within 20 yards of the rocky cliffs, so be prepared to see mother whales and their offspring who come in close to feed. If Hearst Castle is too far a drive but you want something different than what the Carmel coast offers, consider an hour and a half drive to the Mystery Spot in Santa Cruz where trees grow sideways and where gravity behaves in mysterious ways. Tucked in the redwoods, this tour will leave your head spinning. If you want some more head spinning, drive into Santa Cruz and visit the Santa Cruz Boardwalk where one of the world's oldest wooden roller coaters will shake you up a little more. Follow all this with dinner at the Crows Nest restaurant at the yacht club and savor their bacon wraped scallops. I can still taste them... and it's been awhile. The Monterey attractions possibilities here are unlimited, and the links from this page will help you plan in more detail. Simply said, you won't run out of things to do while your here.